Our First-year Experience Librarian, Cindy Fisher, is a guest blogger over at the Chronicle of Higher Education‘s ProfHacker site. In her post, she lauds LibX, a pretty complex, library-specific browser extension from a couple of innovators at VaTech that makes finding and accessing available resources in your library exponentially simpler. Like I said, it’s pretty complex, so I’ll let Cindy explain it to you. On Saturday, July 24, Library Instruction Services hosted the Amazing Library Race as part of the Honors Colloquium sponsored by the School of Undergraduate Studies. The Colloquium, in its 29th year, invites exceptional high-school students from throughout the state to a unique summer program designed to showcase the very best the university has to offer. Students attend class sessions and special lectures by distinguished faculty in addition to going on tours and choosing among interest sessions hosted by departments across campus. 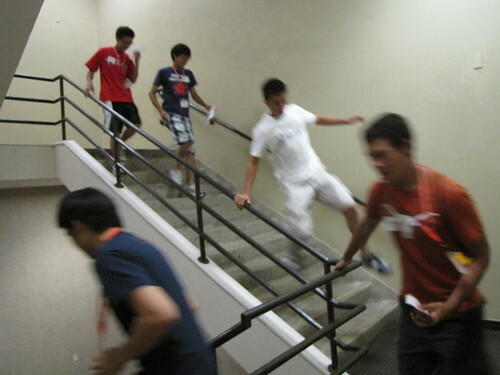 During the Amazing Library Race, ten groups raced through PCL, following clues for their assigned country that led them through the stacks, to photocopiers and group study rooms, and to our electronic resources before they had to make a mad dash to the finish line in the Map Room. This year, Team Netherlands won, finishing in less than 15 minutes. Donuts were enjoyed by all at the end of the race. The Race is designed to provide students with an introduction to the space and resources of an academic library, allowing them to compare their previous public and school library experiences to the vast collections that they will find in a research library like PCL. At the end of the event, students had questions about the collections of government documents they saw in the stacks, how they could get a job in the Libraries, and how academic librarians will support them in their research as college students. This event remains the highlight of the summer for all of the staff in Library Instruction Services and consistently receives rave reviews from the Colloquialists.